At the beginning of January I started my IVF treatment & yesterday we found out that the pregnancy test was negative. We are both very sad & gutted. We are however lucky & happy we still very much have each other & are looking to the future. When I was little I always wanted to go to ballet or tap lessons & promised myself that if the IVF didn't work (which it hasn't) I would look into doing adult ballet. Tonight I checked out adult ballet in York & found lessons on a Monday night which I am going to give a whirl!! I was scared of needles before doing the IVF & managed to do all but 2 of my injections myself...& believe me there were many to do!!!! When me & my younger sister & brother were small we decided it would be a good idea to colour our bedroom wall paper in & consequently had all our pens & pencils confiscated!! When I was 10 I watched part of a Freddie Kruger film & was so scared for months I dreaded going to bed. I use to lie & say I felt ill when I woke everyone up shouting after nightmares!!!! To this day I have NEVER watched any part of one of those films for fear the nightmares will come back! Although I don't like horror I do like most vampire films/programs. I'm not keen on the Twilight films though. I am a Damon fan from Vampire Diaries. I would love to have met Queen Elizabeth & Queen Victoria. I think they are both astounding women. So far this year I have read 4 books after not reading anything for over 2 years!! Finally I would really like a cleaner because my dogs moulting fur is getting on my nerves!!! I'm sorry to hear about your treatment. Enjoy your ballet class! I've taken adult tap for ~6 years and I love it. I appreciate it a lot more than I did as a kid too. 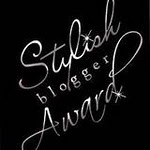 Ah thank you Helen my very first blog award.. Will take pride of place on my blog.